Experience the reduction in the appearance of bags, puffiness, fine lines, and wrinkles. Order the Genucel plant stem cell therapy for bags and puffiness here. Non-paid user. Results may vary from person to person. The other two women can be seen in the videos below. If you're tired of trying cream after cream, only to be disappointed over and over again, your search is over. The promise of this entire site is that, with Genucel, you'll begin to notice a difference...guaranteed. Because we not only know why, and how, Genucel works, but as you'd expect, we also know about the causes of the skin issues you face, and why other creams didn't work for you. But before we get into how you can reduce the appearance of bags and puffiness, we'd like to do something special: make you an informed consumer. We feel that men and women who have been given a basic introduction to the causes of these skin issues stand to make better decisions. That said, we'd like to inform you about the main causes of the skin issues you came here for. Before we really get into the nitty gritty, what do we need to know about lines and wrinkles that appear on our faces? We first need to know the root cause. Generally speaking, stress can be a contributing factor. A good rest, a healthy lifestyle, and good cleansing habits obviously help. A person's genetic makeup may be a contributing factor to how their body expresses age. Another contributing factor, which we touched on above, is environment and lifestyle. Having a peaceful countenance, living in a health-conducive environment, and having a good fitness routine all have positive effects that can be measured inside your body, and seen on your face. Having said that, it is a fact that as some people age, they may lose some of their skin’s elasticity. You may have experienced this yourself. Crow’s feet: Smiling causes lines to develop in the corners of your eyes. The skin here is thin and is therefore very sensitive, especially to a movement that happens repeatedly. Lines on side of the mouth: These are also called worry lines, and is obviously caused by frowning. Lines on the forehead: These are otherwise called frown lines. This appears as a part of the natural aging process. However, exposure to the harmful UV rays of the sun can hasten the appearance of these lines. Bags: Under-eye bags may be caused by aging, the sagging of fat that's usually around the eye, and/or the accumulation of fluid. Puffiness: One cause of puffy eyes can be an excess of sodium in the diet, which can lead to fluid retention. It may also be a natural part of the aging process. If you’re like most men and women who care for how they look, you must have searched every nook and cranny for the perfect anti-aging cream. There are both expensive and inexpensive brands that promise to deliver, but alas, you saw little or no difference on your face. The painful part comes when you’ve shelled out quite a lump of cash for these. That was the experience of many people...before they found Genucel or saw the commercial. Those other brands don’t contain the right kind of ingredients, or in the effective amounts. Chamonix uses the effective concentrations of the main ingredient, Eyeseryl. More importantly, because it’s made from a natural ingredient, it’s safe on your skin. Other brands make use of harsh chemicals (like some preservatives) that eventually dry your skin and worsen the appearance of fine lines and wrinkles. If there’s one thing skin experts tell you, it’s that you should never expose your face to anything harsh. Some brands don’t divulge all the ingredients used in the formulation of their face creams. Hence, you’re fooled into buying something that’s actually harmful for your skin. Genucel, on the other hand, contains natural ingredients, while using the ground-breaking plant stem cell technology. Other brands either have no antioxidants in their formulation, or may have trace amounts that are not sufficient enough. The way to younger skin isn’t just through moisturization. Antioxidants play an active role in maintaining that vibrant look on the skin. As you’ll see in the later part of this article, Genucel makes use of a good number of antioxidants that have been proven safe, effective, and more importantly, powerful. Depending on how you measure it, there's a trend that continues to grow: the demand for natural ingredients used in consumer products. The fact that you're reading this shows that, more and more, consumers want to be sure that the ingredients used in their products are natural, safe, and effective. Genucel works because it’s natural, but the best part of it all is that it uses plant stem cell technology. This is a plant-based stem cell ingredient that’s harvested from Rare Swiss apples that are native to Switzerland. This is just one of Genucel's key ingredients. It has been shown to have amazing effects on the skin. Genucel is made by Chamonix, a company whose line of skin care treatment has helped thousands of men and women reclaim their youthful look. Eyeseryl – This has the ability to effectively reduce the appearance of eye puffiness. PhytoCellTec Malus Domestica plant stem cells – This comes from a rare Swiss apple that’s found in Switzerland. It's extract helps skin attain its youthful look by rejuvenating the old skin cells. Green tea leaf extract – Helps protect skin from free radical damage with its powerful antioxidant that fights early signs of aging. Algae extract – Algae contains compounds that stabilize the minerals found on the skin. More importantly, algae is also known for its anti-inflammatory properties. Algae is also popularly used to help fight acne. Hydrolyzed marine collagen – Allows the skin to be more elastic and to fight the appearance of fine lines, crow’s feet, and wrinkles. Also allows skin to stay strong and supple. Goji berry extract – Exposure to the sun, lifestyle, and diet causes damage to the skin. This extract slows down the signs of aging and helps protect it from further wear and tear. As you can see, the active ingredients found in Genucel are natural and are therefore safe and gentle on the skin. Laurie Dhue (National News Anchor and TV Personality) – She tried Genucel when someone gave her a bag. She can attest to this miracle of a product as she saw a big difference in as little as 2 to 3 weeks. She’s been extremely impressed with the results as these have been immediate and lasting. Suzanne Sena (Celebrity TV Host) – She says that this is the breakthrough to bags and puffiness. She did the research herself and was clearly impressed. Ingrid Hoffman (Celebrity TV Chef) – She saw the difference in less than 12 hours. She couldn’t believe at how much younger she looked. Well-known TV personalities don’t just put their stamp of approval on anything. They know the weight of their influence, and this is a testament to the quality product that Genucel is. And throughout the Web, you can find that we're pretty well established, thanks to the flagship product that this is. 1. Genucel Plant Stem Cell Therapy: This is the heart of our system, and what you've been reading about. The key idea behind this plant stem cell system is that stem cells are a class of undifferentiated cells that can divide and ultimately become another type of cell. 2. Genucel XV: With immediate effects (described below), this component also helps with the reduction of the appearance of facial wrinkles. It features a synergystic blend of hyaluronic acid, CoQ10, vitamin B3 and vitamin B6. 3. Genucel immediate effects: This solution helps to smoothen away wrinkles and the appearance of fine lines around the eyes, including crow's feet and brow lines. 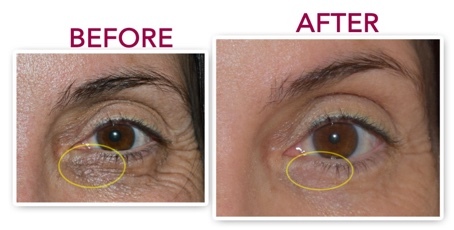 Relaxoderm technology is the foundation for it's anti-wrinkle effects. 4. Cristalles Microdermabrasion: The appearance of skin roughness, fine facial lines, wrinkles, age spots, and skin discoloration are all addressed using a process known as microdermabrasion. Our Cristalles Microdermabrasion uses magnesium oxide, which is the same active ingredient that doctors' offices and spas use in their microdermabrasion process. This easy-to-use cream base can give you visible results in as little as two or three minutes! 5. Bonus: Genucel Eyelid Treatment: If droopy eyelids are a concern for you, we think you'll love our Eyelid Treatment. Chamonix' innovation led to a formula that firms, tightens, and lifts the appearance of droopy eyelids. The powerful peptide proteins nourish delicate skin for softer, smoother, more youthful eyes. They also have the effect of brightening and revitalizing skin tone appearance so eyes look younger, more luminous and radiant. If sun spots have been a bother to you, then this choice might be for you. It contains ingredients that help fade the appearance of sun spots. It also visibly evens out skin tones and brightens skin for a more vibrant appearance. Lumiskin, which is used for its ability to brighten skin appearance. Marine Hydrolyzed Collagen, which helps curb the damage caused by environmental factors, such as UV rays, as well as damage associated with the aging process. Alpha-Arbutin, which works for all skin types. It promotes the appearance of brighter skin and visibly evens out skin tone. Stay-C. Vitamin C, which is a naturally-occurring antioxidant, plays an important role in beautiful skin. It can help brighten the appearance of skin and visibly improve overall skin tone. The Genucel Deep Firming Serum features the latest Plant Stem Cell technology. And, as you know by now, this technology helps preserve the appearance of a youthful look. With Liposome Technology, it's proven to deliver its active ingredient, Vitamin C, at a 7.5% concentration to the deepest layer (the dermis) of the skin. This results in great-looking skin that will leave your face glowing. The 24-hour hydration and leaves your skin feeling silky smooth. All these you get at no extra cost. For a discounted price, you get a 60-day supply of the following: Genucel Plant Stem Cell Eye Therapy, the Eyelid Treatment, Genucel XV, Immediate Effects, and Cristalles Microdermabrasion. You can’t get this kind of package anywhere else at the value we offer here. And...don't forget your bonus choice of either the Sun Spot Corrector or the Deep Firming Serum. Remember that we started by making a promise? We hope we've convinced you that when you order Genucel now, you're not just buying another eye cream. Instead, you're investing in beauty. Your beauty.